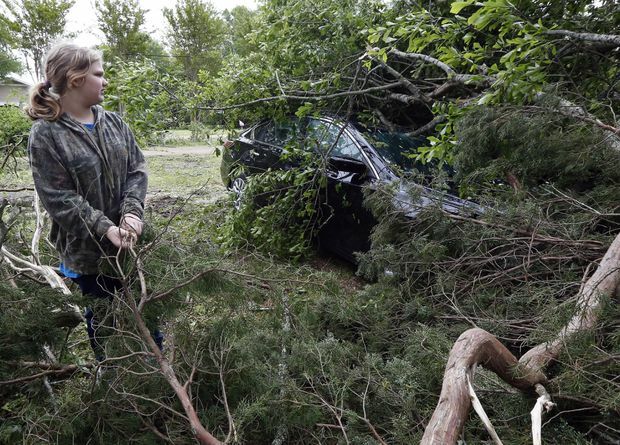 Kayla Easterling of Flora, Miss., looks at a tree-limb covered automobile that belongs of a member of her church on April 14, 2019. The vehicle was one of several properties damaged or destroyed by severe weather in the state. Powerful storms swept across the Southern U.S. on Sunday after unleashing suspected tornadoes and flooding that killed at least eight people, injured dozens and flattened much of a Texas town. Three children were among the dead. Shelby is about 90 miles (145 kilometres) northeast of Cleveland. Authorities said 13-year-old Sebastian Omar Martinez drowned in a drainage canal after flash flooding struck Bawcomville, near Monroe, said Deputy Glenn Springfield of the Ouachita Parish Sheriff’s Department. Separately, one person died when a car was submerged in flood waters in Calhoun, also near Monroe.